Botswana’s magnificent Okavango Delta, which is the world’s largest inland delta hosts a maze of hidden channels, deep lagoons and large lakes. Camp Okavango’s elegant thatch and lethaka main lodge building, shaded by giant Mangosteen Trees, features a cocktail bar, lounge and wildlife reference library. The dining room leads onto an expansive open-air patio for evenings around the fireside offering guests a chance to view the stars beneath the crystal clear skies of Botswana. Other facilities include a secluded bird-viewing hide and a sun-kissed deck with plunge pool for relaxing during the hot midday hours. Camp Okavango accommodates only 24 guests in intimate exclusivity in East African-style safari tents, individually situated on raised teak platforms with en-suite facilities and private viewing decks. For those who demand the ultimate in exclusivity, Camp Okavango boasts the “Okavango Suite”, a thatched cottage offering complete privacy – ideal for honeymooners. Game -viewing activities are conducted by experienced professional guides and include exploring the Okavango by mokoro in eco-friendly canoes where guests can relish in the serenity of this magnificent site and get a chance to see the small critters of the Delta, such as the tiny painted reed frog amongst others. Alternatively explore the Delta by motorboat and take pleasure in the essence of the surrounding panoramic views of lagoons and windy channels. Guided nature walks on the various islands allow for opportunity to track some of the larger species that inhabit this water wilderness. Bird-watching opportunities are outstanding as more than 400 species of birds flourish in this wet wonderland, and fishing for bream and tiger fish is also offered on a catch and release basis. 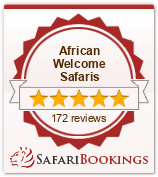 Camp Okavango is a water-based camp and game-drive activities, using safari vehicles, are not possible. Please note that children under the age of 16 years may not take part in any walking or mokoro activities.